Sometimes I think Rich Dufresne invented Salvia. I know he invented Agastache for all intents and purposes (I wish he had a penny for every one sold). Over the years he's sent me cuttings and seed and pictures of hundreds of salvias, whetting my curiosity about this pantropical, pantemperate and just plain panegyrical group of plants. 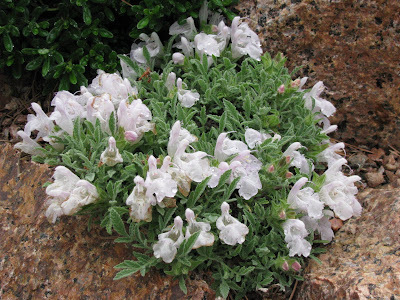 There is one species that Rich won't probably grow very well in North Carolina: Salvia caespitosa is the undisputed rock garden gem of this giant genus. Like so many other fabulous Turkish plants, it was introduced into general cultivation about the time the Flora of Turkey was being written, and probably traces to an Alpine Garden expedition, or perhaps even to Peter Davis, mastermind of that incredible book. I probably grow several dozen salvias. I have probably grown nearly 100 kinds in my day. And this is really a drop in the salvia bucket. To paraphrase Socrates the night before he drank hemlock, "I want to die growing one Salvia more".